Cuba wrap-up: Was it worth the trip? 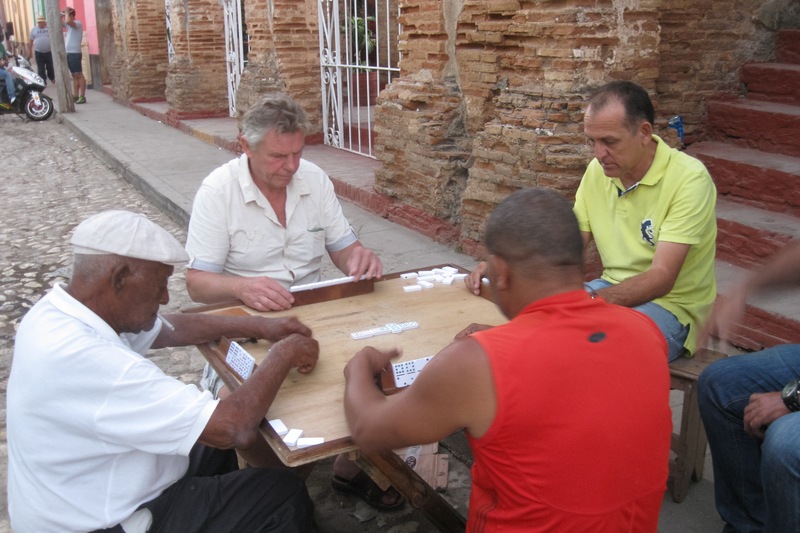 Men playing dominoes on a street in Trinidad. They were very serious. I have had several friends come back from Cuba raving about the place. So it was about time I checked it out for myself. In the end, I’m glad I went. It is a fascinating place, unlike anywhere else. Would I go back? Probably only if I visited some different parts and went with a person who had never been there. But I don’t think I’ll plan another solo trip there anytime soon. And by no means would I recommend this place to a casual traveler. You have to work at Cuba, and plan well. It’s no Club Med. – It’s cheap: Airfare from Seattle was $432 RT on Alaska via Los Angeles (but the Cuban visa cost $100 so that should be added). And once you are there, the B&B’s are only $35 a night including breakfast. And if you venture out of the tourist areas, beers are a buck and ice cream cones can be had for 4 cents. – It’s friendly: The casa hosts and their families and neighbors were genuinely sweet and fun, and super helpful. And occasionally you would meet locals who went out of their way to provide directions or give you good advice. – It’s a step back in time: The old cars, the old buildings, the revolutionary propaganda — it’s 1959 all over again, when life moved at a slower pace. – Rum! I’m not much of a hard liquor drinker, but damn, that stuff was great. And dirt cheap. And there are no nanny-state open-container laws, so drink away in public. Oh and I hear the cigars are great too, but I don’t smoke. – It can be beautiful: The January weather was wonderful — around 80 and sunny most of the time. And if you get off the beaten path, there are some pristine beaches. – Their situation is fascinating: The booming tourist trade has brought in more foreign currency, and raised the standard of living for those connected to the trade. Will these changes bring dramatic changes to their revolutionary ideals now that Fidel is gone? – It’s safe: There’s hardly any crime so it felt really safe day or night. That said, women will be catcalled. – The touts/hustlers: I lost count of how many times people walked up to me on the street and said “Hello friend, where are you from?” I always said no or ignored them, but it was constant. On the last day, when I ignored one of them near the Nacionale Hotel in Havana, the guy cursed me in Spanish. – Poor internet: You need to buy cards good for an hour of time (and finding them is no easy task in itself), and when you do find a place to get on, it either doesn’t work or drops after a few minutes. OTOH, it was nice to take a break from 24-7 connectedness. – Poor air quality: All of those old cars and buses are not exactly up to emissions code. As in not at all. You feel like you’re breathing in a tailpipe when traveling in Havana traffic. Oh and it’s dry in the winter so it’s super dusty. – Poor infrastructure: Jeff and I would have killed to for a commercial flight to exist between Havana and Trinidad to avoid the 8-hour bus trip over sometimes-potholey roads. The buses themselves were decent, however. – The currency issue: The tourist currency is tied to the US dollar. Then there’s the moneda nacionale, which is what people use for grocery purchases and stuff like that – there are 25 of these pesos to each dollar. It was challenging keeping them straight, and having what you needed for each situation. And the exchange offices often had long lines. And you can’t use ATM’s. – Ugh: This might have only been a challenge for me personally. I was having some kind of constant allergic reaction the whole trip. And, um, digestive issues for the second half of the trip. And attempts to get relief at a pharmacy failed. So stock up on all possible drug-store items before you go. WOW! I was there about 17 years ago around Thanksgiving (when Bush had just “won” the elections for his 2nd term). I don’t remember much in the way of street names and towns but I remember loving it! There were a lot of challenges but I saw it as and eye-opener to how easy we have it in the States. I remember how spare electricity was over there and when I came back to the States, I happened to spend a few days at a Casino town in Lake Tahoe area. The contrast in affluence was rather humbling. I remember the Cubans as being very hospitable and very knowledgeable about their country. They couldn’t talk freely about many things. Our taxi driver, for instance, couldn’t tell us outright that we were driving around Fidel Castro’s compound. Many roads outside of Havana were non existent as a form of control. I wonder if it’s still like that now.